Know Your Audience. Ditch SEO. Home / Know Your Audience. Ditch SEO. Use SEO as a tool, not a mythical savior. Not the value of them. The supposed sacredness of them. Sure, we need to use them. But why do we idolize them?? Why do we assign such a lofty reverence in business toward the need to 'rank #1 on a search engine page'? Would you rather be #1 on a search engine page or receive sustained, relevant traffic? Would you rather have visitors bounce or would you rather have hungry folks visit your site and find what they need? Our search capability is a powerful tool. But we must use it to serve the priority. What the search technology of the internet brings ... what search engine algorithms give ... what advances in communication technology are delivering for us ... is more power than ever before to communicate with our audience. SEO and other technology does not manufacture your target audience. Now, I'm not saying it's time to dump SEO practices. Not in any way. I'm saying the priority is audience attraction. It's time to use the smart capabilities of SEO practices to serve and nurture your target audience. 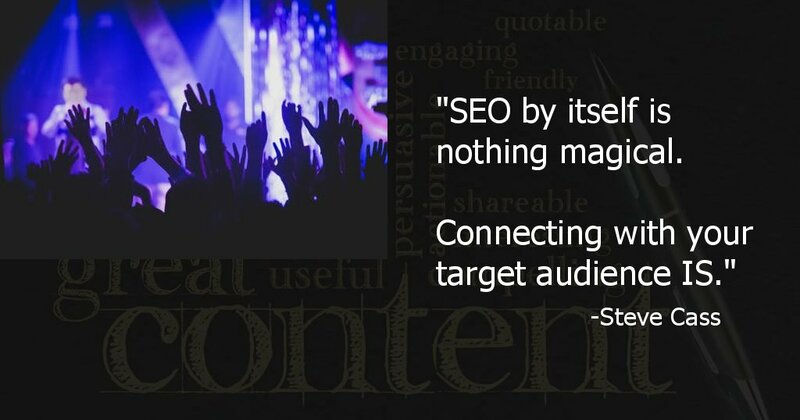 SEO is nothing magical. Connecting with your target audience IS. Let your efforts be to learn the language of your audience. “One hour a day, read. Read everything in the world except your business. Read junk. Very much junk. Read so that anything that interests you will stick in your memory. Great marketing begins by becoming the best listener you've ever known. Before creating any type of content, know what your people say. If you don't know your target audience, you badly need to. Ask the right questions. Gather deep information. Use the CORTA planning tool. The CORTA planning tool helps you gather information to create Personas (people profiles) of your target audience. 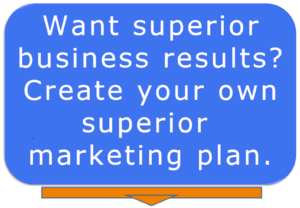 This is one of the first things to accomplish in your overall marketing plan. And every other part of the plan you create serves your target audience. There is no other reason to create a plan. What's the CORTA planning tool? The CORTA planning tool is a document outlining everything you need to build a marketing strategy to serve your target audience. It's inside the Relevant Content Marketing plan philosophy that I use. Visit that page for an in-depth overview of the philosophy. This philosophy is outlined below. But for this article, most elements are grayed out, except our topic for today: SEO. There are 3 SEO elements in Relevant Content Marketing. As a whole, these 3 elements are called Search Optimization. Search Optimization means that the optimization of your content is more for people than for search engines. We don't optimize our content primarily for robots, we optimize it for people. Robots are involved, so they get a nod. But they don't get a majority nod. Let's break down what SEO is for the website of 2019 and beyond. These elements are crucial for establishing, acknowledging, and maintaining relationships with your target audience. and getting the reader to take action. This form of optimizing is for what your audience sees. In the case of keywords, your audience sees you reflecting their language back at them! SEO copywriters will add each of these page improvements. 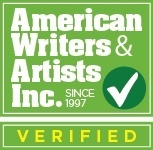 Or you can hire them as a writer to add your content. Ask your SEO copywriter if they'll look at your entire site and give you a Site Audit report for improvements. If you're at the point of a website build or a website rebuild, ask your copywriter if they can provide a Site Architecture plan. and any other content, online or not. A writer should create the documents you desire. They should follow YOUR SEO content creation plan. Sure, I'm referring to blogs, articles and pages for your website. But I'm also referring to any marketing document your company publishes. No matter the company document, you want to present a consistent marketing message. Avoid having conflicting messages by creating a Relevant Content Master Plan (a single document that creates a central marketing message library). This master plan houses all of your marketing messages that you can use for any web page, white paper, blog, case study, email autoresponder series, etc. You'll have all your marketing messages at your fingertips: keywords, facts, testimonies, tag lines, value statements, your Unique Selling Proposition, anticipated objections – and much, much more. This is not just a whiz-bang, nice-thing-to-have. It means more than that. This will show consistency to those who have eyes on your company. It'll rocket your audience participation, revenue, E-A-T score with Google, (more on E-A-T below ...) and show those on the fence that you have very serious intentions. You can then say to your audience, "Come on in, the water's MORE than fine!" Hire a copywriter who'll write your documents with YOUR plan in mind. Hire a copywriter that's ready to write using your voice, and ready to use your messages. ... and more. These are the traditional areas you've thought about when you heard the term 'SEO'. These are the technical, behind-the-scenes adjustments. They're like taking a wrench to your car to make sure you win the race. ... but you can make all the mechanical adjustments and not follow the right course. You can end up going nowhere, fast. Unlike the first two areas of SEO, your audience doesn't see the results of these adjustments. For example, when you or a writer create keywords and key phrases, the search robots take note of these. This, and other factors, create the search engine ranking for those keywords and phrases. There's value in understanding the keywords that are best for your site. Use keywords which portray your Unique Selling Proposition, and not just 'any' keywords. When you use keywords that are more specific to your USP, you'll draw more of your specific crowd. Using something like "yellow apples" is a better phrase than using only "apples". A copywriter can help you solidify your USP. They can make sure your list is appropriate and on-target for your audience. Hire a copywriter who knows the power of keyword usage. Have them use YOUR keywords, if you have a plan. Hire a copywriter that understands how to perform back-end technical tasks so your communication to the search engines are complete. The back-end technical adjustments will continue to become less and less of a chore as technology progresses. All three of these areas are critical for connecting with your audience. They're an inseparable trio. Your efforts will be a clanging bell that's not heard. For all three work together to the tune of Expertise, Authority, and Trust. SEO is a tool that helps you connect with your audience. The larger metric of how well these three SEO areas are doing is Expertise, Authority, and Trust. E-A-T is a criteria that Google invented to evaluate and score websites. It reports how a website shows it's expertise in the subject matter. It finds the authority shown by social signals (web page traffic, social media buzz, and reports on reputation) and the trust factor the website ultimately generates. Google also evaluates the owners of the company and website. It finds how helpful the Homepage, About and Customer Service pages actually are. The better visibility Google wants to give to your website. So you see, Google is actually in the business of supporting your effort to connect with your target audience. It's in their best interest. Creating relationships with your audience is the best way to signal Google that you mean business. They reward you with better search results page rankings. Your reward isn't because of back-end SEO tweaks but because of all your concerted SEO efforts. Your ranking rewards don't come only as a keyword usage strategy: it's a combination of you showing your audience and Google your Expertise, Authority, and Trust. These signals to your audience and to Google continue to spiral upward towards your inevitable success. nocking the arrow and positioning your release aid. Only now are you ready to draw the bow! Now you're ready to create the right content. And release that content arrow aimed true toward your target audience. Search Optimization makes this possible. After you've made your marketing plan, hire a copywriter to create content that knows SEO. Question their knowledge on these three levels so you'll know their capabilities. If you have ideas for a website, but you're not exactly sure which way to go, hire a copywriter that can give you a Site Architecture report. The report should include a skeleton of each page of the site, with recommendations on structure according to your original ideas. If you currently have a website, and would like input on it's effectiveness, hire a copywriter that will give you a Site Audit. This report will include a 35-point checklist with recommendations on page structure and any content upgrade suggestions. No matter if your business is B2C (Business-to-consumer) or B2B (Business-to-Business), you're always concerned with B2P (Business-to-People). The SEO of today is much more than site adjustments. What ideas do you have to optimize your web content? Tell me below.